It’s cold. It’s lonely. It’s really cold. It’s really lonely. It’s unfathomably cold. And it’s lonely. That’s what this mere glimpse of life on an Arctic expedition looks like. The visuals are jarring: the ship looks like it’s parked on land, the mustaches are frozen, the research looks difficult. But it also must be so beautiful to be in places where so few have gone before. 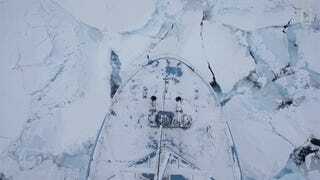 For five months in 2015, a team of researchers drifted with polar ice, their ship tethered to an ice floe as they collected data to help them better understand how the loss of sea ice will affect the planet. The air above the Arctic Ocean has warmed on average about 5°F in the past century—more than twice the global average—and sea ice covers less and less of it. Most researchers study the ice during the summer. This team, battling bone-chilling cold, tracked it from when it formed in winter until it started melting in spring. And occasionally found time to kick a soccer ball around the floe.